When Innovationedge is asked to serve as the agent for a client with a marketable invention, Innovationedge typically takes the approach we call completing the “Circuit of Innovation®” to connect the innovations to the marketplace. Typically, the goal is to find partners who wish to license or acquire the innovation. 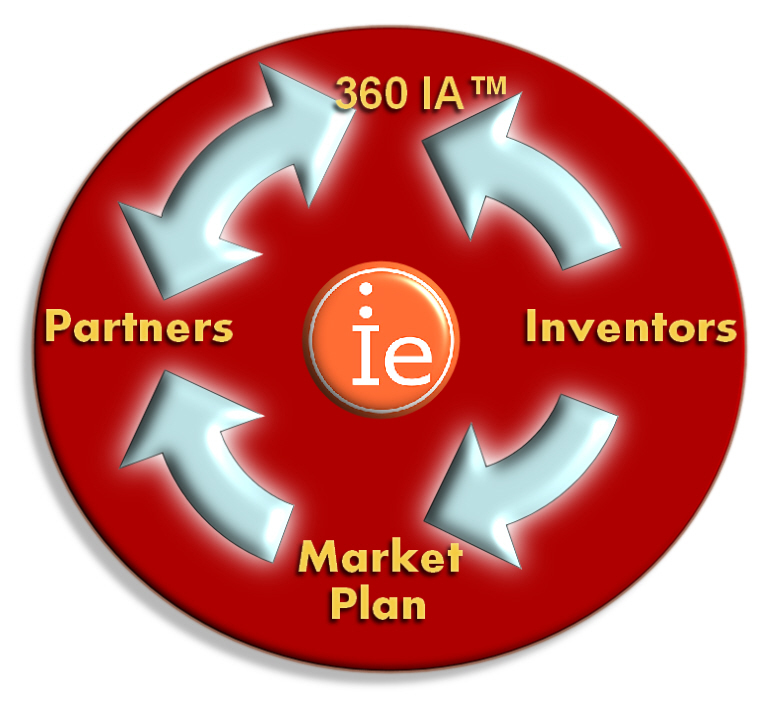 In this approach, much of which is proprietary to Innovationedge, we prepare a business plan, marketing roadmap and a 360 IA™ analysis to develop a value proposition that is supported by the intellectual asset strategy. This often involves working to strengthen the existing IA estate, considering IA types other than patents alone. Trademarks, domain names, defensive publications, and other tools are included, in addition to a foundation of patents (when appropriate) to provide competitive advantage. The Circuit of Innovation® approach begins with an examination of the existing IA estate, coupled with a survey of competitive estates and points of differentiation and advantage in the proposed business model. If we find key points are not adequately protected or if there are other gaps, we make recommendations for strengthening the estate. We also consider the need to prevent competitive activity in the client’s area, and may make recommendations regarding defensive publications or other tools to mitigate competitive threats. In any case, the IA estate is considered and developed in terms of the value proposition being created for a potential licensee or acquirer. As the IA estate is being reviewed and strengthened, the business plan and marketing strategy are created and developed into a roadmap including an innovation pipeline. Considerations of which parts of the market are most likely to result in success for the initial product launch, and which order the segments should be approached are critical to the roadmap. The analysis considers the needs and benefits addressed by the service and the linkage to market segments and potential partners. A strategy is developed identifying which partner is best for initial efforts, and which may be reserved for later work. With the marketing roadmap and IA strategy in place, we then prepare the pitch for the target partners, and rely on our broad networks to assist us in contacting key decision makers. IE’s unique and extremely broad network often plays a key role in assisting us in bringing innovation opportunities before decision makers. The initial diligence typically takes 8 weeks, though when there are complicating factors such as regulatory issues to address, diligence may take longer. The process of executing a marketing roadmap often involves seeding and interest building within target corporations, which can take a period of months before substantial negotiations begin. Decision making by large corporations can often require 12-18 months of discussions, depending on the situation. Thus, it is important for clients to have realistic expectations of the time required to move toward a deal, not to mention the many risk factors that need to be overcome along the way.